They may be cute and furry, but chipmunks can cause some serious problems when they gather in large numbers. They typically inhabit matured woodlands and parks, but also burrow under patios and flowerbeds to get at bulbs and seeds. Every once in a while, they also sneak into homes and businesses, and attempt to eat any unsecured pet food. You can identify chipmunks by their striped or spotted markings. They are smaller than their cousin the squirrel, only 5-6 inches in length (without the tail). They also differ from their larger cousins, in that squirrels climb and jump, while chipmunks typically stay on the ground, darting from place to place. 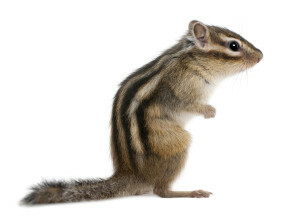 Chipmunks are primarily ground-dwellers, meaning that they like to dig and live in underground burrows. In nature, they build their homes under rocks or tree roots, but in yards, they also use porches, decks and gutters. When a family of chipmunks makes an area their home, they create a network of rooms. This not only makes them one of the most difficult issues to resolve, but also causes a great deal of damage. The gradual collapse of these excavations can lead to stress cracks in cement slab construction. It can also result in pavement with an inwardly sloped grade, a situation conducive to drainage issues and wet basements. Exclusion is the best way to avoid chipmunk issues. For example, use L-shaped footers to prevent them from borrowing around porches, sidewalks, retaining walls and foundations. Trim back plantings that may provide food or cover around these areas, and encircle them a plant-free with a gravel border. However, once a problem has developed, we use baiting and live trapping, the two most successful approaches for dealing with a chipmunk problem.